Guess some fans are still not over it – Nina Dobrev probably got the shock of her life when she received a tweet from ex Ian Somerhalder (who is now married to Nikki Reed) saying that he loves her. Before Ian-Nikki fans get too upset, it turns out that Ian’s Twitter account was hacked. Nina has yet to respond to the chaos. Nina was recently spotted on the red carpet of the 2015 Creative Arts Emmy Awards. 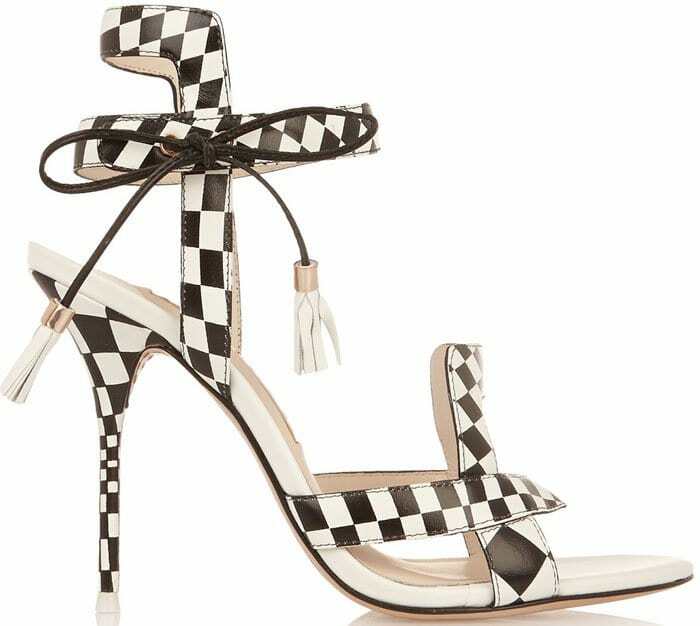 Nina is wearing a dress from Mugler that she paired with the Sophia Webster “Poppy” checkered leather sandals. The 26-year-old accessorized her look with a clutch from Salvatore Ferragamo and Martin Katz jewelry. The Sophia Webster “Poppy” heels are most definitely the highlight of Nina Dobrev’s otherwise meh look. We love the cute geometric pattern happening throughout the shoe and how it’s softened by two tassels. To grab your own pair, head on over to Net-A-Porter.